As per existing provisions of the Income Tax Act, income chargeable under the head ‘Capital gains’ is computed by taking into account the amount of “full value of consideration” (FVC) received or accrued on transfer of a capital asset. To curb abusive practices, various deeming provisions are incorporated under the Act, one of which is the concept of deemed consideration. Section 50C is an example which deems stamp duty value as full value of consideration for transfer of immovable property in certain cases. 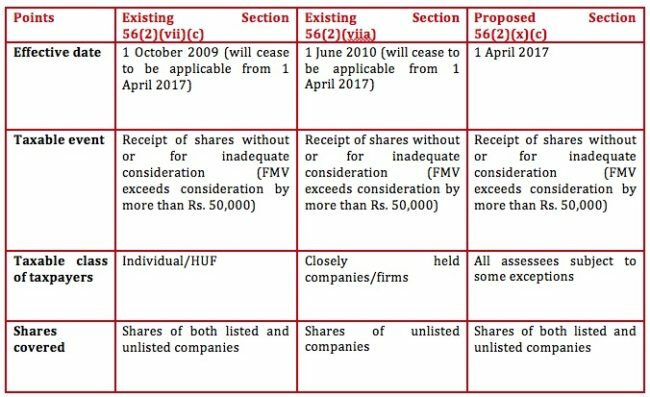 Expanding the list, Budget 2017-18 has proposed to insert a new section 50CA to provide for deeming the value of consideration of unquoted shares to cover transfer of unquoted shares on a value less than the fair market value. This amendment will take effect from 1st April, 2018 and will, accordingly, apply in relation to the assessment year 2018-19 and subsequent assessment years. Following is the excerpt from the finance bill, 2017. “Special provision for full value of consideration for transfer of share other than quoted share. ‘50CA. Where the consideration received or accruing as a result of the transfer by an assessee of a capital asset, being share of a company other than a quoted share, is less than the fair market value of such share determined in such manner as may be prescribed, the value so determined shall, for the purposes of section 48, be deemed to be the full value of consideration received or accruing as a result of such transfer. Here is the detailed scoop on the proposed amendment. Capital asset targeted in Section 50CA is an unquoted share. Explanation to the section rather defines a quoted share, leaving a broad room for subjective interpretation of term “unquoted share”. Transaction being covered is a transfer of unquoted shares. The term “transfer” has been defined under section 2(47) which covers sale, exchange etc.. 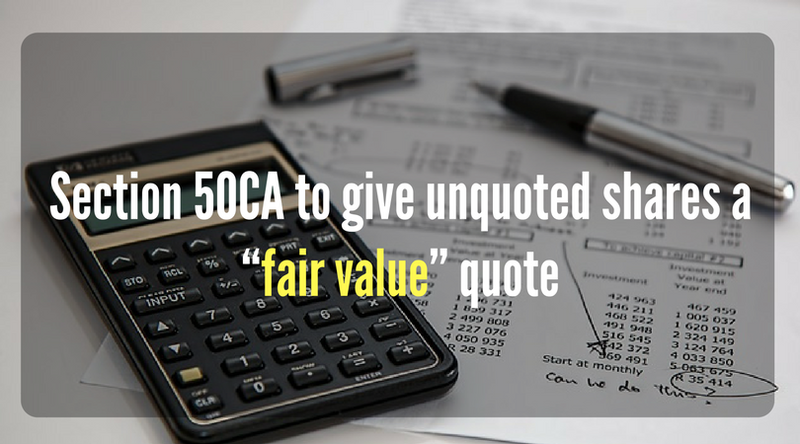 Section 50CA is attracted only when the value of consideration is less than the fair market value (FMV) of unquoted shares. FMV of the shares is to be determined in accordance with the method yet to be prescribed. Where the value of consideration is less than the FMV, FMV shall be deemed to be full value of consideration and accordingly, capital gains are to be computed. The impact could be better understood if we analyze the Section 56(2)(vii), 56(2)(viia) and the proposed section 56(2)(x). As we can see, in any case, if the consideration of shares is less than the fair market value, the differential will be taxed in the hands of the recipient under “Income from other sources”. The cumulative effect of all these sections as well as Section 50CA is a double taxation in the hands of both seller and purchaser. How?? Whilst section 50CA proposes to tax the difference between the FMV and the consideration received for transfer of shares as capital gains in the hands of transferor, section 56(2) taxes the same difference in the hands of the transferee of such shares. Let us understand the same with the following example. ABC acquired 1,000 shares of a private limited company at INR 40 per share. The shares were sold by ABC to XYZ at INR 100 per share. The FMV of the shares on the date of transfer was INR 160 per share. Shares are in the nature of capital asset. Hence, transfer of capital asset attracts capital gains tax. Further, shares of a private limited company are unquoted shares. Transfer of unquoted shares took place @ INR 100 which is less than the FMV of INR 160. Hence Section 50C will be attracted. It is important to note here that for determination of FMV under section 56(2)(x), Rule 11U and 11UA of the Income-tax Rules, 1962 have been prescribed. However, the manner of determining the FMV of shares under section 50CA is yet to be prescribed. We assume both to be same. The existing provisions of section 56(2)(vii) or 56(2)(viia) as well as proposed provision section 56(2)(x) provide for taxing the difference between the FMV of unquoted shares and consideration under the head ‘income from other sources’, if the FMV exceeds the consideration by more than INR 50,000. In this case, the position remains the same for the recipient even after proposed amendment. In totality, we can see, the excess of FMV over consideration (i.e. INR 60,000) is getting taxed in hands of both transferor and transferee, leading to an incidence of double taxation. The method for determining the fair market value of unquoted shares for the purposes of proposed section 50CA is yet to be prescribed. The possible methods are discounted cash flow (DCF) method or NAV method. The main difference between NAV and DCF is that the latter arrives at a valuation based on future viability of the business. This would mean that the valuation or fair value of a deal arrived at through DCF is likely to be higher as against NAV. Using the NAV could mean that only companies with huge real estate on their books and shell companies that are selling the whole business to escape stamp duty will come under the tax scrutiny. Interpretation of unquoted shares has been made very subjective which leaves grounds for litigation. Inserting an anti-abuse provision is fine but a provision that could potentially lead to double taxation is not justified. Though the intent of Section 50CA is genuine but at the same time, the intent is essentially handicapped by suspecting or impacting genuine deals or transactions. It is absolutely necessary at this point that government should consider re-drafting this proposed amendment, possibly clarifying the grey areas as well or else, consider its roll-back. Keep visiting www.taxingtax.com and stay tuned on Budget 2017-18 updates. ← When does your Provident fund become inoperative?